Skin, nail and hair fungus. The problems and damage they cause are not only repulsive, but sometimes irreversible. Nail fungus alone affects an estimated 35 million people, both young and old - from athletes to the elderly alike. In fact, those over 50, with diabetes or with circulation problems are in the highest risk groups for contracting such problems. Strike the root cause of fungus and protect yourself from its deadly, deteriorating effects. It began with our highly acclaimed phytoceramide based skin care supplements. Then came one of the most life changing, all natural, gastrointestinal supplements to ever be developed. From skincare, to sports performance, to vision, gastrointestinal supplements and more. PhytAge Labs provides you with the most pure, most organic, ingredients available in every health supplement we create. Creams, gels, spray ons, nor anything like them can solve the underlying problems that cause fungus. Treating your hair, skin and nails by applying a topical ointment on the ‘outer shell’ won’t solve your problem. 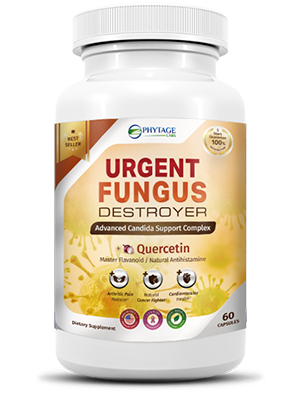 Urgent Fungus Destroyer contains a list of 20 all natural, fungus fighting, active ingredients in every 1 capsule. As with all PhytAge Labs supplements, it’s a complex formula that has shown proven results that work from the inside out.